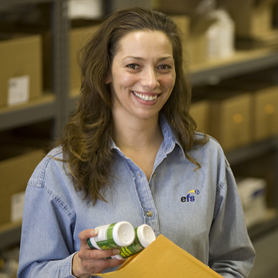 Since 2001, eFulfillment Service (EFS) has been the trusted name in eCommerce order fulfillment as a result of our ongoing commitment to value, technology and client satisfaction. Every day, hundreds of Internet sellers from around the world rely on EFS for fast, accurate and dependable order fulfillment with a guarantee. Reports for inventory, orders, shipped items, etc. At EFS, we provide an unmatched level of transparency, reliability and personal touch for our clients. That’s probably one of the reasons we’ve gotten so much recognition over the years. Our mission is to make order fulfillment easy and worry-free for all online sellers, and we want to do the same for you. Get a fulfillment quote today, and discover why so many Internet sellers around the world have put their trust in eFulfillment Service.